Impressive-Marsh successfully rewrites the founding moment of American Modernist poetry. ---Mark Van Wienen, Northern Illinois University ""Cogently argued, instructive, and sensitive, Marsh's revisionist reading opens new insights that will elicit lively comment and critical response."" ---Douglas Wixson, University of Missouri-Rolla Between 1909 and 1922, the genre of poetry was remade. Literary scholars have long debated why modern American poetry emerged when and how it did. While earlier poetry had rhymed, scanned, and dealt with conventional subjects such as love and nature, modern poetry looked and sounded very different and considered new areas of experience. 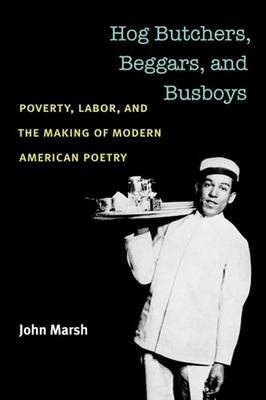 Hog Butchers, Beggars, and Busboys: Poverty, Labor, and the Making of Modern American Poetry argues that this change was partially the result of modern poets writing into their verse what other poetry had suppressed: the gritty realities of modern life, including the problems of the poor and working class. A closer look at the early works of the 20th century's best known poets (William Carlos Williams, T. S. Eliot, Edna St. Vincent Millay, Claude McKay, Langston Hughes, and Carl Sandburg) reveals the long-neglected role the labor problem-including sweatshops, strikes, unemployment, woman and child labor, and immigration---played in the formation of canonical modern American poetry. A revisionary history of literary modernism and exploration into how poets uniquely made the labor problem their own, this book will appeal to modernists in the fields of American and British literature as well as scholars in American studies and the growing field of working-class literature.